Winter presents a number of challenges on the homestead, one of which is how to grow out rabbits. Today I’ll explain our grow out method for the growing seasons, and what we do in winter! When grass is growing, we grow out meat rabbits or replacement breeders in portable pens we call rabbit tractors. To learn more here’s an article where we profile our rabbit tractors. We love many things about this setup. The rabbits get to graze on fresh grass daily, which lessens feed costs, creates healthy grassfed meat, and means less mowing! They also get to live in small groups, which means less pens to deal with versus keeping them individually in cages. In winter when grass isn’t growing and there’s a chance of snow, we must change our management practices. We cannot leave the tractor in place on the ground because then rabbits would stay on their own manure (a very bad thing! ), plus it would be difficult to access the tractor in snow. 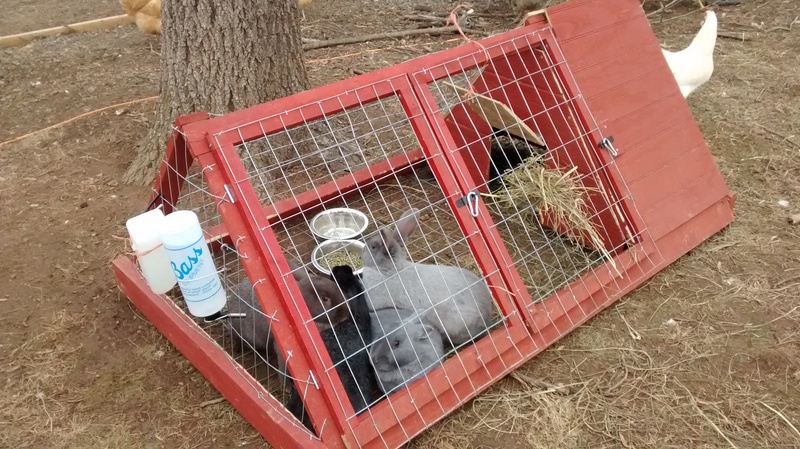 So for those who pasture their rabbits in the growing season, there are a few choices for what to do to grow out rabbits in winter. Harvest rabbits at weaning. At 8 weeks, rabbits should be about 3.5-4.5lbs. 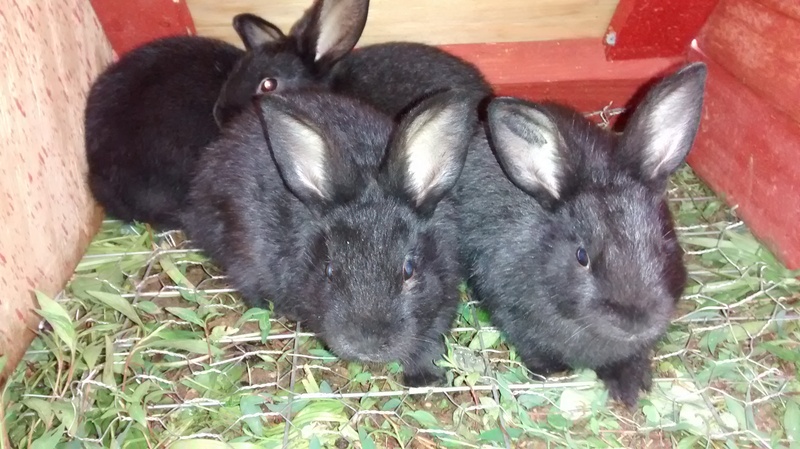 A breeder can choose to harvest any rabbits for meat at this point, and then not have to worry about what space to use for growing out rabbits. This hasn’t been our choice, but it’s a valid option. Grow out rabbits in extra hanging cages. This is what we’ve done in past years. We had extra hanging cages, so we’d wean a litter into the extra cage. 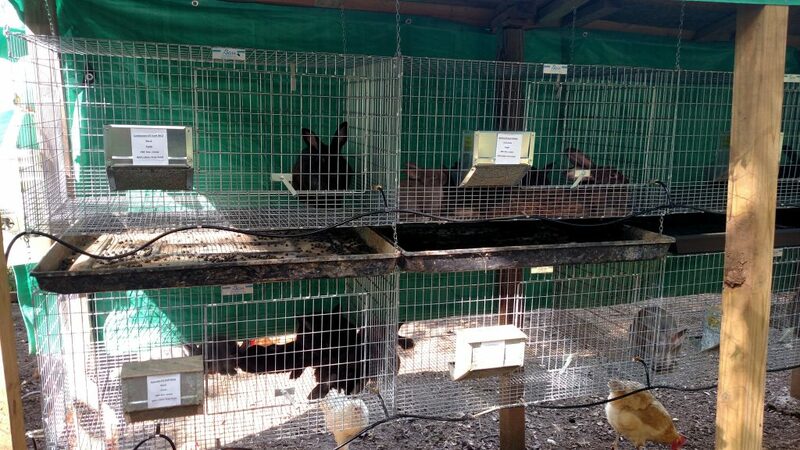 We typically sell a few from each litter as breeding stock, so the cage wasn’t crowded. When the rabbits were large enough for us, we’d harvest them. Grow out rabbits in a colony. 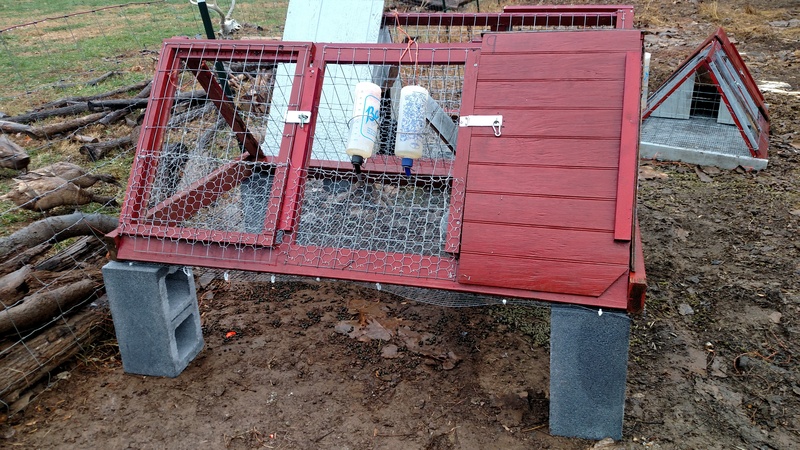 A lot of people love raising rabbits in colonies, and people especially like this setup for growing out meat rabbits to harvest. If you have a secure space such as a barn stall or dog kennel, this may be a great option. You’d have to make sure the rabbits were protected from precipitation, though, as you wouldn’t want them cold and wet in winter. We considered doing this, but we are currently experimenting with a breeding colony, and don’t want to start another colony at this time. Grow out rabbits in rabbit tractors elevated off of the ground. This winter we have made some adjustments to our rabbit tractors so we can elevate them on cinder blocks and continue to use them as grow out space over winter! In Part 2 I show and explain how we have retrofitted our tractors for winter use!